Farming around Lake Tekapo with Tekapo Tourism. 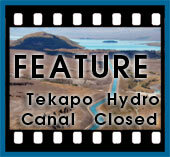 Lake Tekapo is surrounded by farming stations thousands of hectares in size. 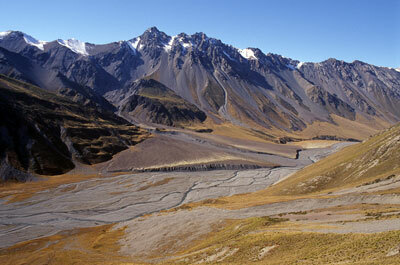 The land that makes up these farms consists of both mountainous and low land areas. The mountainous areas are remote, rugged and uneconomic and impractical to develop as high efficiency grazing. 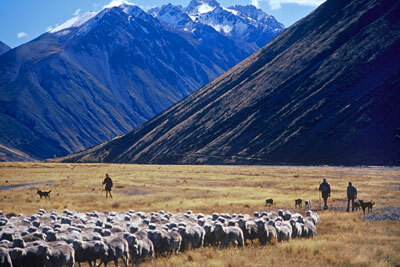 As a result the high country stations have adopted the Merino sheep breed as the most suitable for the mountainous conditions of the Mackenzie Country. During the warm summer months the Merino sheep roam the mountain valleys of the stations grazing in sub-alpine meadows of valleys such as the Forks, Cass, Godley and the Macaulay, to name a few. While the sheep roam the hills, they do not move large distances and journeys are often made by the run-holders in to the hills to 'push' the sheep around on to ungrazed areas of the valleys. Before the significant snows of the high country winter arrive the sheep are collected and brought down in to the low land areas in an event called the Autumn muster. The alarm didn't go off at 5:30 as it was supposed to, but I was OK with that. Another half an hour in the bunk was not an upsetting discovery. Jim was the first one up, annoyed that somehow the three inches of digital technology beside the bunk had not gone off at the right time. The dark hut was filled with a flickering orange glow as the open fire was re-lit and the billy (camp pot) of porridge that had been soaking overnight was placed on the iron rack inches above it. By 6:30 there were four of us standing in the back of the farm vehicle and another three in the cab. Behind us was a caged trailer with a number of eager dogs knowing that a good day's walk was ahead of them. What they may not have understood was that the walking was going to be done over some of the best mountain scenery in the world. For them it was just going to be another day at work. We drove up the valley beyond a massive shingle fan, 2km (1.2miles) across at its base. A shingle fan is a slow moving river of fractured rock that delivers the debris from the eroding peaks of the mountain range and carries it down and out across the valley floor like a massive grey flood frozen in time. As the sun was beginning the chase the shadows down the valley walls, we threw on packs, left the vehicle and headed up the Ailsa Stream in search of the Merino sheep that had spent the summer grazing the valley. By 9:00am we were flooded in sunlight and had climbed to 1,500 metres (4,900ft) above sea level. A quick bite to eat and it was time to find sheep. The muster was executed by staggering musters vertically up the side of the valley, from the lower riverbed-beat at 1,000 metres (3300ft) above sea level, to the top-beat at 2,100 metres (6800ft). The line of men and women then walked at a steady rate along the valley wall trying to maintain the altitude they have been set for the day. This was easier said than done with several impassable guts, bluffs and cliffs along the valley wall. As each mob of sheep was found the dogs worked them down the mountain side to the next musterer who then worked them down to the next and so on, until they were down in the riverbed. The shepherd on the riverbed beat then herded them down the valley floor at the same rate as we walked around the hillside. 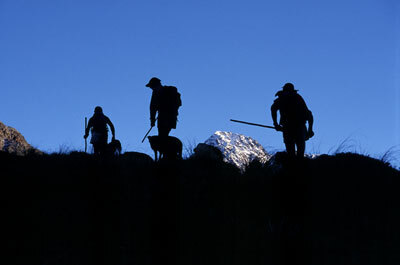 By the end of the day we had walked over 15km across the steep mountainside of the Cass Valley to the 'Tin Hut'. The sheep we had collected during the day were taken down beyond the hut so they could be mustered further down the valley the following day with the other sheep found. As the sun once again threw a shadow across the valley floor, the boots were off, tomorrow's lunch was made and then it was time for a well earned beer before tea. For over twenty years Ron has been coming up to Glenmore Station to cook for the seven or so others that come on the muster. While we had been out chasing sheep around, Ron had remained at the hut preparing the evening meal. It was apparent when you saw the meal, that there were a few years worth of experience behind it, for a large dixie (huge pot) was lifted from the coals of the fire and a lamb roast was presented from inside. Along with the lamb came roasted and boiled vegetables and gravy to die for. This muster was not going to be an event to loose weight on! Over the evening the beers became whiskies and the stories got more interesting. By 10:00pm the lights were off and the hut was once again filled with a flickering orange of dying open fire. Over the next two days we collected over a thousand sheep from the sides of the Cass Valley and brought them out to the flats of Glenmore Station where they would remain throughout winter and spring.